HARTFORD — Throughout Domestic Violence Awareness Month in October, The Mary Kay Foundation is awarding $20,000 grants to 150 domestic violence shelters across the United States, the District of Columbia, Puerto Rico and Guam for a total of $3 million. Today Interval House was chosen to receive one of the annual grants to further the organization’s efforts to combat domestic violence and provide services throughout the 24 cities and towns it covers. This year’s highly sought-after $3 million grant slate brings the total investment in The Foundation’s annual shelter grant program to nearly $42 million. From left to right: Interval House Board Chair Garry Lapidus, Interval House President/CEO Mary-Jane Foster, Interval House Grant Volunteer Cara Bergstrom-Lynch and Mary Kay Foundation Ambassador Cherie Griffith-Dunn, pose with the check awarded to Interval House. 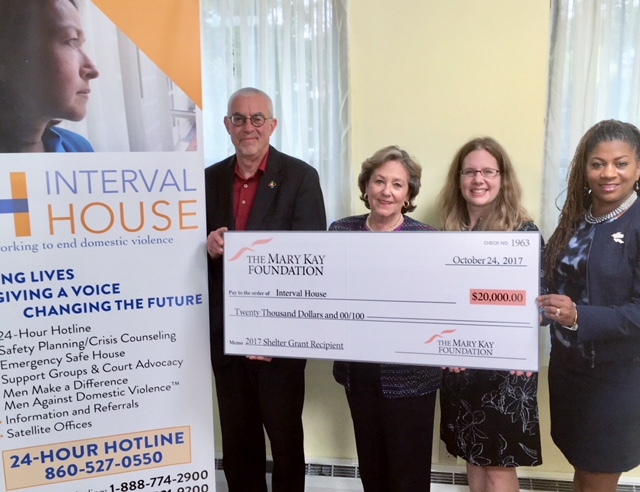 Interval House will use the May Kay Foundation funding to maintain its 20-bed safe house and enhance services to victims in residence,” said Mary-Jane Foster, Interval House President and CEO. Since 1977, Interval House has helped more than 230,000 victims of domestic violence. The agency operates a 24- hour crisis hotline, 20-bed emergency safe house and provides counseling for victims and advocates in both the criminal and civil court system. About The Mary Kay Foundation℠: The Mary Kay Foundation℠ was created in 1996, and its mission is two-fold: to fund research of cancers affecting women and to help prevent domestic violence while raising awareness of the issue. The Mary Kay Foundation℠ has awarded $70.7 million to shelters and programs addressing domestic violence prevention and cancer researchers and related causes throughout the United States. To learn more about The Mary Kay Foundation℠, please visit www.marykayfoundation.org or call 1-877-MKCARES (652-2737).